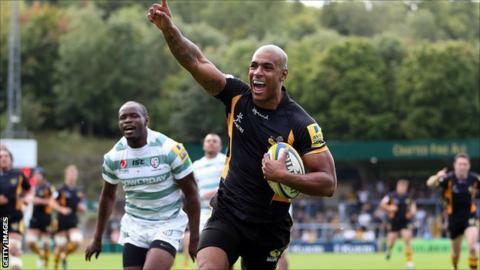 Wasps earned their first victory of the season at the expense of London Irish, who remain winless in 2012-13. The visitors took a lead of two points into the half-time interval, thanks to a try from Marland Yarde and two penalties from Steven Shingler. Shingler added another penalty, but Stephen Jones added four penalties and a conversion to a Tom Varndell try. Converted scores from Joe Simpson, Sakaria Taulafo and Varndell, plus another Jones penalty, sealed the win. Jones, capped more than 100 times for Wales, ended the day with 23 points and produced a faultless kicking display on his debut for Wasps. As for London Irish, they have lost all three of their opening Premiership fixtures and conceded 123 points in the process. The Exiles had started brightly and led 11-9 at the break. Centres Sailosi Tagicakibau and Jonathan Joseph combined to supply Yarde, who produced a wonderful burst of pace to go in at the corner for the only try of the first half. Varndell crossed after good work from Hugo Southwell to put the home side in front at Adams Park, but it was only in the final quarter that Wasps ran away with the game. Simpson collected the ball from a ruck to dart over the line, replacement Taulafo drove over in the corner and Varndell added his second after a lung-busting run from Simpson to complete a bonus-point win. "The first half was pretty disappointing. We were second best in most departments. "Coming in at half-time, the dressing room wasn't a very happy place to be. We had to step up in every department and we did. "In the second half, we looked a completely different team. We were far more potent with the ball in hand, defensively we looked far stronger and the forwards stepped up. "I thought we deserved to win but the bonus point probably flattered us." "There's no reason to panic. It's early doors in this competition. "We were in front at half-time but we dropped off the pace 55 minutes into the game. That's really disappointing. "But we have to cop it on the chin. We have to take our medicine, learn our lessons from this defeat and soldier on. "We have a young group and we've struggled to put a win together. Young lads are only human and that's a problem for us but they're giving it all they've got." Wasps: Southwell; Varndell, Daly, Masi, Wade; Jones, Simpson; Payne, Thomas, Staibano; Palmer, Wentzel; Launchbury, Poff, Johnson. Replacements: McIntyre for Payne (70), Lindsay for T. Thomas (45), Taulafo for Staibano (41), Haskell for Launchbury (64), Vunipola for Johnson (66). Not Used: Davies, Robinson, Bell. London Irish: Homer; Ojo, Joseph, Tagicakibau, Yarde; Shingler, O'Leary; Lahiff, Lawson, Halavatau; Skivington, Evans; Danaher, Treviranus, Fisher. Replacements: Aulika for Lahiff (70), Ryan for Halavatau (10), Low for Skivington (70), Gray for Fisher (70). Not Used: Blaney, Watson, Geraghty, Moates.